Bio Notes: William Graham Holford was born on 22 March 1907 in South Africa and educated at the Diocesan College, Cape Town. He studied architecture under Sir Charles Reilly at Liverpool University, graduating with first-class honours and winning many awards, including the Rome Scholarship in 1930. His Rome scholarship was extended to allow him to complete a study of Italian piazzas and town plans, and while there he met a fellow Rome Scholar, the mural painter Marjorie Brooks, whom he married in 1933. He was admitted ARIBA in 1932, was RIBA Henry L Florence Bursar in 1935 and was awarded a distinction in his town planning diploma. A further prize from Liverpool University enabled him to visit America. Soon afterwards he succeeded Patrick Abercrombie as Professor of Civic Design at Liverpool University in 1937. Although he also remained an architect throughout his career, his firm executed very few notable buildings, and it is for his prodigious contribution to the teaching and practice of town planning that he is best remembered. During the Second World War, Holford led a Government team of architects charged with the design of ordnance depots, camps and factories. He was heavily involved with the development of post-war British town planning and was largely responsible for drafting the Town and Country Planning Act 1947. In 1948, he again succeeded Abercrombie as Professor of Town Planning at University College of London until he retired in 1970. He was elected FRIBA in 1948. In the mid-1950s the Government of Australia asked Holford to report on the planning and development of Canberra, which had suffered during the depression in the 1930s, from the effects of the Second World War and post-war economic stringency. His report led to the creation of the National Capital Development Commission (NCDC), which contolled Canberra's development between 1957 and 1989. His advice led to the evolution of Canberra into a city of car-based suburbs based on the British New Town concept. He also made a regional plan for Durban, South Africa in 1968. In England Holford is notable for town planning work in Cambridge in 1950 and in the City of London in 1950-51, and for developing a plan, begun in 1956, for the redevelopment of Paternoster Square, near St Paul's Cathedral, London. This area was devastated by aerial bombardment in The Blitz. From 1961 to 1967 the entire superblock between St Paul's churchyard and Newgate Street was redeveloped according to Holford's scheme but the area has since been redeveloped. In 1962, Holford presented a plan which would have created a "double-decker" Piccadilly Circus, with a new pedestrian concourse above the ground-level traffic. This concept was kept alive throughout the rest of 60s, but was finally abandoned as the scheme only allowed for a 20% increase in traffic, while the Government required 50%. Holford set up an office in Edinburgh sometime before 1970. His Scottish partners were Kenneth Waltham Whitfield and Graeme Gibson Dobson. Holford was knighted in 1953 and in 1965 he was made a life peer as Baron Holford, of Kemp Town in the County of Sussex by the Wilson Government, the first town planner to be made a Lord. 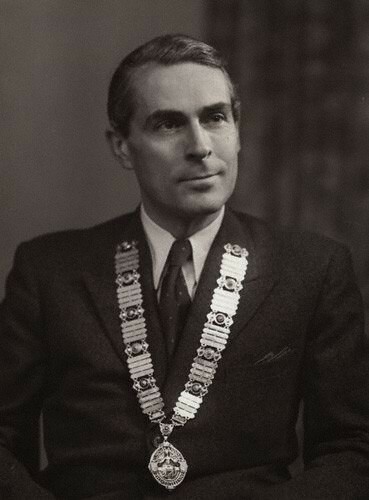 He served as Vice President of the RIBA in 1951-2, President in 1960-62 and was Royal Gold Medallist in 1963. He was also a President of the Royal Town Planning Institute. He was awarded various honorary degrees including an LLD from Liverpool University and a DCL from Dunelm. He was also a member of the Royal Fine Art Commission from 1943 to 1969 and of the Historic Buildings Council from 1953, was elected ARA in 1961 and RA in 1968, and was Romanes Lecturer at Oxford in 1969. Remarkably eloquent and authoritative but lacking any form of pomposity, he is also remembered as a man of great humour. In 1972, Holford accepted the part-time post of director of the Leverhulme Trust Fund. It was around this time that he gave up all professional practice to care for his wife, whom he had been nursing ever since a tragic illness in the early 1960s had left her an invalid. In 1974 Holford was appointed chairman of the Department of the Environment's joint committee on the planning of Bath. He died on 17 October the following year. He was survived by his wife; they had no children. 1950s Clyde Tunnel Whiteinch-Linthouse Glasgow Scotland Planning consultant for project.